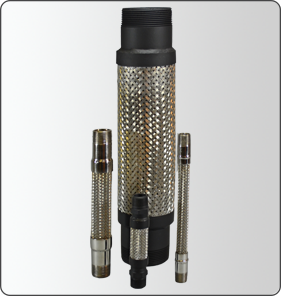 Stainless steel braided hose flexible connectors are designed to dampen vibration, suppress noise, adjust or correct misalignment, and relieve stresses in piping systems. A braided metal hose connector flexes and bends, but will not extend or compress axially. All motion stresses are absorbed at right angles to the axis of the connector. To be effective, they must be installed perpendicular to the movement of the piping, or parallel to the shaft of vibrating equipment. When used to dampen vibration, the connector should be installed as close as possible to the vibrating equipment and the piping securely anchored at the outboard end of the connector, away from the source of vibration. The longer the length, the better the connector will perform. Working pressures are usually rated at 70°F and must be de-rated for higher operating temperatures. Stock HVAC connectors in standard lengths are usually capable of &frac18;" lateral offset. Longer lengths and shorter lengths are available when the system may require them. Threaded end connectors can be fabricated in special lengths, with different materials in the fittings, and built for higher working pressures and operating temperatures. We also offer transitional connections, change in direction fittings (90° or 45°), and reducing/increasing. Solving piping vibration, noise, and motion problems since 1954. Copyright 2015 Thermo Tech, Inc.